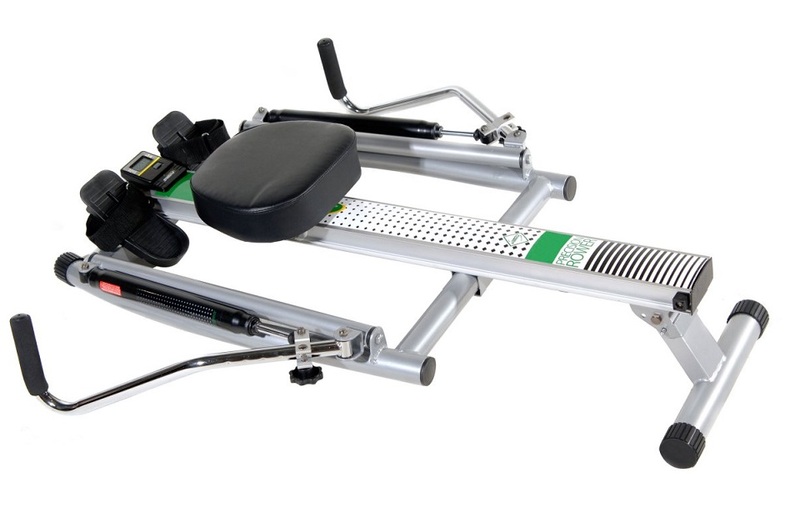 The Stamina 1215 is another model in this brand's budget catalog of rowing machines. What sets this one apart from the others is the 'orbital' rowing action that mimics the rowing action on water - more on this later. So let's start with the basics. This is a hydraulic resistance machine using pistons for your muscles to work against. 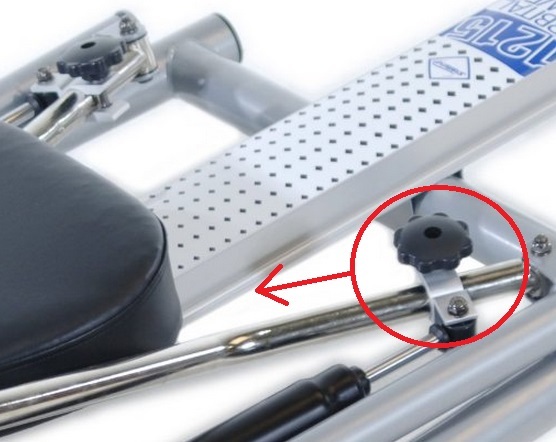 You can change the resistance by altering the position of the pistons on the handles using the black knobs - see red circle on the diagram lower right. Some may find the resistance tough at what looks like the lowest setting, but this can be made easier by lowering the position of the arm on the handles. The aluminium and steel frame feels solid, but the rollers under the seat don't look strong enough in our opinion. The machine specification states a maximum user weight of 250 lbs, but while the frame might be capable of supporting this weight, we feel the seat and rollers would struggle with a heavy rower. We suggest if you're over 200 lbs you need to look for a larger machine. While we're on the subject of the seat, this is one of the few around that isn't molded. This may at first seem a disadvantage but it's actually quite a soft and comfortable seat. But then again, we doubt if you'll ever row on this model for a period longer than 20 minutes before the pistons go soft. So what about the orbital rowing action? If you've used other rowers, you may not like this or find it difficult to do initially. You can use it with a normal ergo action of a single handle, but with practice most will manage the 'natural' rowing action. But why bother? The orbital action works a few more muscles across the chest, shoulders and upper back - but not to the extent you'd see noticeable results. Yet you'd normally buy a rowing machine for cardiovascular fitness - and take it from us, this machine is not built for speed. One useful feature to make up for its inability to cope with a high stroke rate, is that you can adjust the height of the track for a more challenging workout - it's simple to change and only takes a few seconds. Let's look at the rowing position. One of the 1215's advantages (its compact size) becomes a disadvantage if you're not average height. If you're under 5' 3", or taller than 6' you will find it an uncomfortable position and not want to use it for longer than ten minutes. The foam handles are adequate, but after a long session they become sticky under a sweaty palm. When not in use the handles fold in for easy storage. It's also light enough for most people to pick up and store vertically in a small space. It's small, basic but easy to use. Shows your speed, workout time, distance, stroke rate, and calories used. 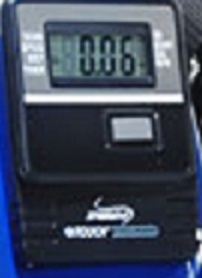 It comes with a scan mode that displays each readout for 6 seconds. But due to its low position it's not easy to read when rowing fast. There are no pre-set programs or functions, but you'll have to spend a few hundred dollars more to get features such as race boats and PC compatible models. It's a reasonable budget machine for a beginner as a light user only. It has an interesting rowing action that the purists will like, but if you're thinking of using solely a rower for your training, this isn't the one for you. 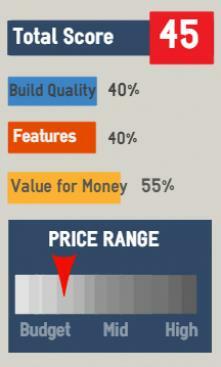 If you're on a tight budget, Amazon could have it at a good price that might tempt you. Difficult to use at a high stroke rate. Hydraulic pistons will need replacing with heavy usage. 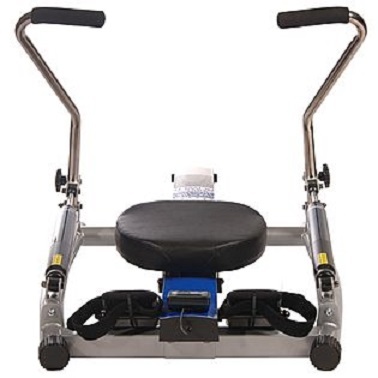 50" x 33" x 14"
If you have more money to spend on a rowing machine and would like an orbital action, the Kettler Kadett is a better option in our view.